When I opened the plaid scarf and leather jacket combo gift I got for Christmas from my little brother, I was a little unsure. Can I wear a leather jacket? I mean, I know that they are super-in right now and everything, but I'm just not a leather person. If you knew me in person, you would definitely think, Yeah, she's a floral skirt type of person. I'm just not edgy. Turns out, I look exactly like myself in wearing it: I just look like a nice person wearing a leather jacket. Whew. This is my first outfit post in 2014, so I feel like I need to say something amazing about my clothes goals for the year (like that's even a thing). I already shared my personal goals, but here are my thoughts about my "outfits." I will say this over and over again: blogging my outfits has been so good for my personal style. I dress better and I am more conscious of my clothing purchases and how they impact my overall wardrobe. BUT, I want to continue to not care too much about clothes. I want to continue to edit my wardrobe and keep my closet under control. I want to continue to have control over my spending and remember that clothes do not define me and there are so many better things to spend my money on. Aaaaaand Apparently "Clothes Goals" are a real thing. Clothes goal is a real thing, my goal was to not go crazy during the sales! I like the leather jacket/plaid scarf combo on you. You still look like you! I appreciate your clothes goals and am trying to be mindful of that this year as well. Leather suits you! I looked at your pictures before I got to your comment and it didn't make sense because I never would have thought you didn't "fit" in a leather jacket. Love it! Ahh you totally rock this jacket. And once again, we could be twins, because the first time I wore my black leather jacket was with a red scarf! You are totally rocking this jacket!! I have a brown one and a cream one and I find they go with almost everything!! Can I adopt your brother as my own?! That's a pretty fantastic gift. Mine just gets me gift cards - ha! 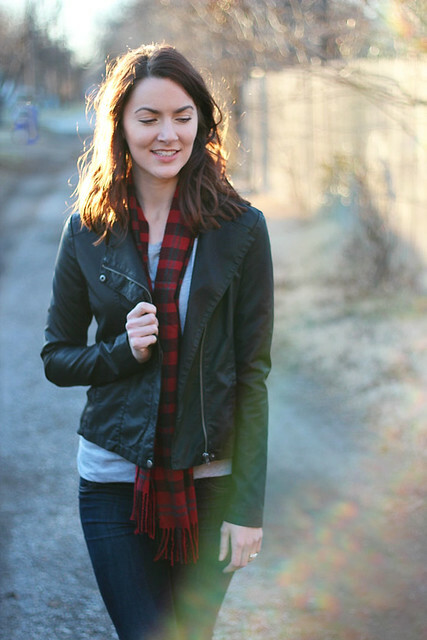 I love plaid, and it looks great paired with the leather jacket! Thanks for the outfit inspiration! Too funny! I just got a faux leather jacket and I felt a little bit like a poser in it, but yeah, I just look like myself wearing a leather jacket. No one will think I'm a biker or a rock star. I'm wearing my plaid scarf today too :) Love the leather jacket! AH. This is pretty much my uniform for the winter. Love it! 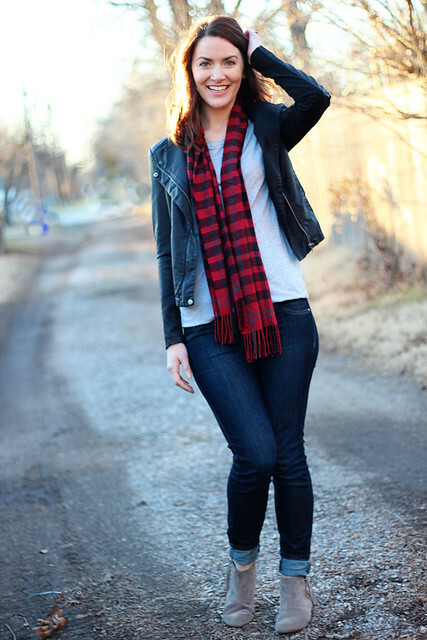 Love the plaid scarf, and it looks awesome with your leather jacket! Very cute! It may not be edgy, but it still looks great! I only have a brown faux-leather jacket, and I want a black one too! Great look! Love the leather jacket!! I think you look great in a leather jacket, but I know what you mean. It's sometimes hard to pictures ourselves wearing something different. What a great brother you have to give you a jacket AND a scarf for Christmas. So nice! Love the booties too! 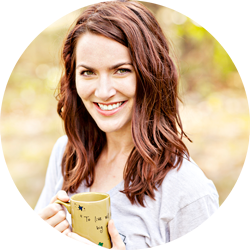 Thanks for following me, for some reason I can't follow back on GFC, but I followed you on Bloglovin! I think leather jackets are so classic and can work on anyone! You definitely pull the look off and I love the scarf too! Looking fierce (and classic). Love the look and the mentality you described in this post! You are TOTALLY a leather jacket kinda girl! HOT!!!!!! Love this outfit! Happy New Year love the leather and plaid mix. you look gorgeous. Your little brother is quite the shopper!! I love that he picked these out for you and that it's a little out of your usual fashion comfort zone. He did great; this is a fun look for you!! The jacket fits you perfectly! And the plaid scarf gives the outfit a cozy vibe! That is a gorgeous leather jacket! I'm really impressed that your brother picked it out for you! This outfit is so wonderful, and it is totally me...so I might be copying you soon :) You should link up with me next Wednesday for WIWW! Love this outfit!! I was a little nervous about leather too; mine's brown, so it felt safer to me, but I LOVE your black one! Congrats on your first leather jacket! It looks perfect on you indeed! Love it with the plaid too. A gift from your brother you say? Goodness he's got great taste! This outfit is awesome! I think you definitely do not have anything to worry about when it comes to rocking the leather/plaid combo. I can definitely relate to your goal of remembering clothes do not define you/us, it's hard to remember sometimes when you have a blog and I know I'm always happiest when it's top of mind! Happy 2014! You look totally fantastic in a leather jacket! They're definitely intimidating at first (who knows why, but I felt the same way), but they add such an interesting layer and texture to an outfit that I find I reach for mine SO often. I think leather jackets are so classic and can work on anyone!